You Have Eevolved Into Espeon! Don’t let its appearances deceive — you may be under its charming spell! 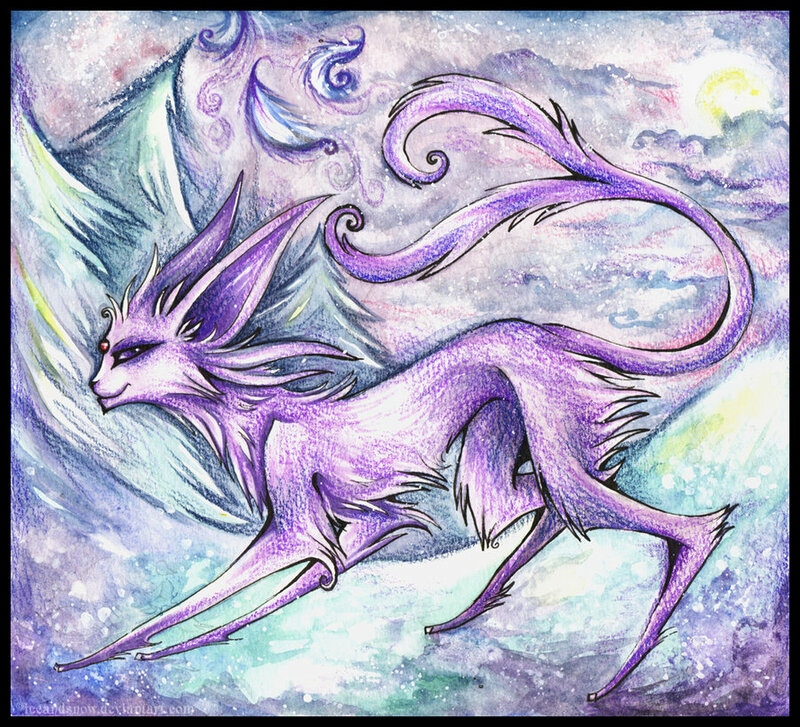 Espeon is a sleek psychic-type eeveelution, feline-like in appearance while extremely loyal, like a dog. By getting Espeon, you are a master of emotional intelligence. You can make friends incredibly easily, and immediately know what (or what not!) to say. You are well-respected as smart among your peers – but be careful! Without meaning to, you can find yourself manipulating others. Like Espeon, you value others immensely, are invaluable to those for whom you care. An Eevee can eevolve into an Espeon with the help of high friendship. This is likely supposed to resemble a strong bond through trust. In Pokémon XD: Gale of Darkness, it was proven that one can also obtain an Espeon by exposing their Eevee to a Sun Shard. This purple Pokémon’s first big break first occurred in the popular Pokemon TV show episodes Espeon, Not Included and Trouble’s Brewing. In these two episodes, a trainer named Sakura’s Eevee eevolved into the audience’s first Espeon. The Pokemon was well-received, and went on to make many other major appearances, including in 1) Pokemon Heroes, as owned by Annie; 2) The Saffron Con, alongside the trainer Lilian Meridian, in an effort to test on-stage lighting effects; 3) Second Time’s the Charm, in which the powerful leader Anabel challenged the main Pokémon series protagonist Ash and his quintessential companion Pikachu. In this daunting battle, Anabel (and her Espeon) were defeated and rendered unable to win the Ability Symbol; 4) Team Eevee and the Pokémon Rescue Sqaud, alongside all of the other eeveelutions and as a parent figure toward Eevee. Outside of these major show appearences, Espeon has also popped up in a slew of minor roles, including: Eevee and Friends, Johto Photo Finish, Destiny Deoxys, Not on MY Watch ya Don’t [as one of the several Pokemon hypnotised by Psyduck], Giratina and the Sky Warrior, and Hi Ho Silver Wind!. Espeon’s appearance, character, and affect can be summed up in a single adjective: sleek. This Pokemon is sleek as a cat – in fact, it seems to have been designed with many feline traits! It’s quadrupedal, mammalian, soars when it jumps, always lands on its feet, and is skittish as ever. Espeon is a bit of an eeveelution anomaly, as most of its brethren are more bold and fox-like. Espeon is a favorite among girls with its lilac purple cover. It showcases a beautiful and sparkling red jewel right in the middle of its forehead. When this jewel glows, then you’re in for a treat (or not, if you’re on the other end) – a lit-up gem means that the channeling of psychic abilities is underway. Espeon has an incredibly high intellect – it is like a psychic chess master. Its hair and jewel are not there just to charm and look pretty (though they often have that effect). These are also utilized as tools in battle that allow the purple powerhouse to predict upcoming enemy moves. Espeon is always a step ahead of its opponent. Bonus fact: this Pokemon is also a useful travel companion as it can predict the weather! Despite its sometimes shifty feel and feline angst, Espeon, when on your side, is an incredible partner and friend. This popular eeveelution will never let you down, and is a solid choice to any aspiring trainer! This entry was posted in Eeveelutions. Bookmark the permalink.